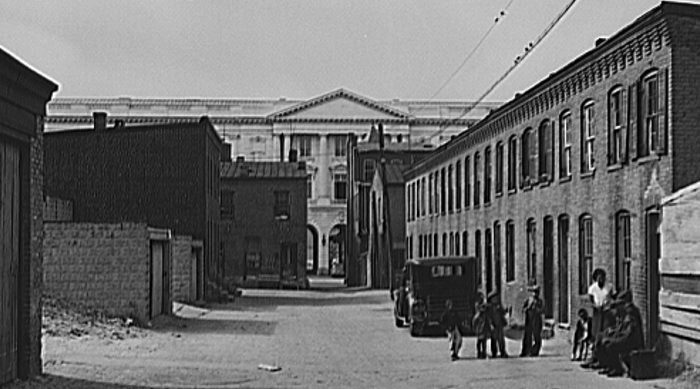 I was recently reading a book about alley life in Washington and found myself looking at a rather remarkable picture: the pediment of the Senate Office Building rising above a decrepit alley. As it turns out, I was not the only one impressed by this image. It is used on the book’s dust cover as well– something my copy lost years ago. While the name of the book is given as “Schoots Court” and “Schottes Court” its name is actually Schott’s Alley. That is the earliest name I can find for it, in the 1871 city directory. Maps from pre-Civil War Washington indicate that there were already a number of houses in the center of Square 725, which is located between 1st, 2nd, B and C Streets, NE. However, it appears that only after the war was it given this name. As was often the case, little notice was given of the people who lived there, as they represented the laborers of the city. The first real information about Schott’s Alley can be gleaned from the 1880 census, with the names and further information on the 100 inhabitants that were counted there in early June of that year. It is unlikely that this represented all those who lived there, but it certainly gives a good sense of the neighborhood. The vast majority – 88 – of the inhabitants listed were African American, and almost all came from either D.C, Maryland or Virginia. The other 12 were all Irish immigrants or the children thereof. Most inhabitants of the alley were laborers of some stripe, though a few, both Irish and African American had worked their way up to a more skilled position, of shoemaker or government clerk. Twenty years later, the population had exploded to 240 inhabitants – or the census taker was much more diligent in his duties. The percentage of whites in the alley has increased dramatically, as well, with now 38% listed as such. The main difference is that these are all from Italy or of Italian extraction. The jobs done by the residents of all races have changed somewhat, as well. There is now a broad mixture of laborers, semi-skilled and skilled laborers. Entirely missing, however, are any white-collar jobs, even of the types of clerks seen earlier. This continues to be the case in the next census. In fact, the biggest difference is that between 1900 and 1910, the alley has become almost entirely white, with 89% of the residents hailing from Italy. It was in this time that the Senate Office Building (Today named after Richard Russell, but possibly being renamed for Senator John McCain in the near future) was built. The 1930 census, in contrast, shows a dramatic drop in the number of residents, with only 74 listed. They are, however, now all African American. In contrast to those who had lived here earlier, many come from well outside the D.C. area, with about half hailing from South Carolina. While the 1940 census now shows the population to have rebounded to 154, the demographics have stayed the same, only the birthplaces listed have expanded dramatically to include most states south of Washington. While it will still be a few years before the 1950 census is released, it will not shed any new light on this small corner of Washington, as Schott’s Alley was razed in the late 1940s to make way for what is today the Dirksen Senate Office Building. Over the next few weeks, I will look at some of the stories of those who live in Schott’s Alley.